Ollie is a firm believer that the practical, hands-on nature of the BSc (Hons) Children’s Nursing degree has played a big part in him securing the start to his career he hoped for. 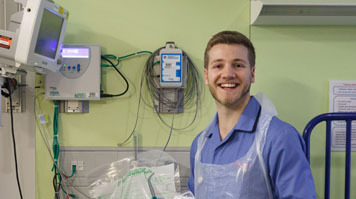 “Part of the reason I chose to study at LSBU was because many of the lecturing staff still work in clinical settings, so they maintain an up-to-the-minute knowledge of clinical techniques and best practice,” he says. The placement opportunities were incredible. The university is linked to some of the best hospitals in the world- Great Ormond Street, Evelina Children’s Hospital, Chelsea and Westminster hospital, and King’s - which really makes it stand out from the opposition. With such a commitment to excellence and a strong foundation in the skills he needs to succeed, it is clear that Ollie is someone for whom nursing doesn’t just form an important part of his family’s history – it is set to form an important part of his future too.